Because I am in the heart of Lancashire, I always use heather-reared Bowland Lamb. But hotpot can be made anywhere and I would always suggest that you use the local lamb from your own region. I use shoulder, neck and shin meat. Season the lamb with 1 tsp salt and a good pinch of pepper, then dust with the flour. 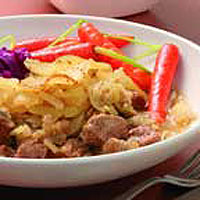 Put the lamb into the base of a pot or casserole with a close-fitting lid. Put 1 tbsp of the butter in a frying pan over a medium heat. Add the onions and 1 tsp salt, cover and sweat the onions, without colouring, for 4-5 minutes. Spread the onions evenly on top of the lamb in the casserole. Peel the potatoes and slice them into 2mm-thick slices. Place in a medium-sized bowl, add the remaining melted butter, season with 1 tsp salt and a pinch of white pepper, and mix well. Arrange the sliced potatoes evenly on top of the onions, reserving the best-shaped rounds for the final layer. Pour over the stock. Cover the pot. Cook in the oven for 30 minutes, then reduce the heat to 130°C, gas mark ½ and cook for 2½ hours more. Remove from the oven and take off the lid. Increase the oven to 180°C, gas mark 4 again and return the dish to the oven for 30-40 minutes or until the potatoes are golden brown. Serve with pickled red cabbage and glazed carrots.